The IntoPlane Kiosk is an easy-to-use touchscreen interface that fueling agents utilize to easily enter their fuel transaction tickets throughout the day. The FuelsManager software includes built-in validates to help improve the accuracy of manually recorded fuel tickets. For some fuel service providers, it can be cost prohibitive to migrate to a real-time data collection process using mobile computers or handheld devices at the wingtip. 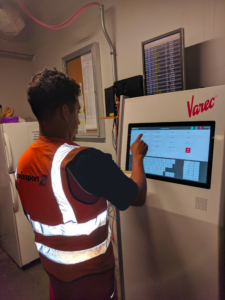 The kiosk offers an easy to use, data entry system that includes key validations to better automate and streamline manual ticket processing operations. With the FuelsManager® software integrated, the kiosk validates key data points, such as aircraft tail number and the starting and ending meter numbers against gross volume. As human errors are often unavoidable and unintentional with handwritten tickets, the kiosk gives fueling agents the opportunity to correct data before completing the data entry process each day.